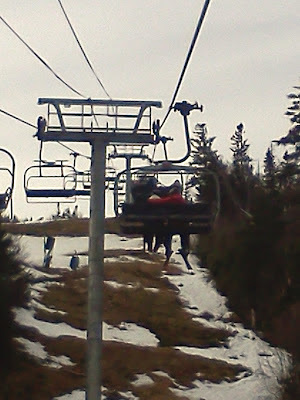 A Family Skiing in Maine: Sugarloaf March 24 - Where did the snow go? Sugarloaf March 24 - Where did the snow go? 6 weeks ago we penciled in a weekend mid-March trip to Sugarloaf to stay with friends and get some skiing in. Sounded like a great idea at the time but this extended period of horrid heat decimated the snow cover at Sugarloaf and all the mountains in Maine. However, since we had some tickets to use on our Sugarloaf frequent skier card, we headed up to get a few turns in and make the best of it. The Sugarloaf snow report indicated 26 trails open. There were really a few ways down the mountain via Tote Road, Kings Landing, Skidder, Sluice, Candyside and Boardwalk. Parts of Narrow Gauge were open but they were having a spring series race on it. It was the most challenging conditions I have ever experienced. There were parts of trails about 3 feet wide as the snow groomers had to harvest snow to make connector paths over bare spots. When these connector paths were on the steep sections, it made for line-ups of people waiting to scrape down the path. On the areas with better trail coverage, it was either sheer ice or this marble sized ice chunk consistency. Very weird to turn through as it was kind of like skiing on marbles. I think part of it was my psychology of defensive skiing. I am so bummed about this early spring for the mountains, but it was tough for everyone judging by all the comments I was hearing. The best trails were probably Candyside and sections of Tote Road. Pretty good trail coverage and the opportunity to get some real ski turns in. Sugarloaf also has a great new lift in Skyline. Very nice ride up and services some awesome terrain when the conditions are better. We made the best of it for a couple of hours and decided to call it early and head back to our friends place to spend an enjoyable and relaxing afternoon off of our skis. According to the Sugarloaf snow report, when the temps drop they are going to light up the snow guns this week to get the existing open trails back in shape. Good for them! Some trail repair will certainly improve the skiing experience. I am hoping the Maine mountains can salvage a spring snowstorm or two. March and April are typically the snowiest months for Sugarloaf and Saddleback! Hopefully there is a trip or two left for us. Regardless, in looking back at our trip reports we got 20 family ski days in from November to March and the boys got countless more times on snow with their school ski race teams. We still had a pretty stellar ski season despite what Mother Nature threw at us. "I am so bummed about this early spring for the mountains..."
It's interesting that conditions sound so much more like early season than the end of the season. In "normal" years most ski areas run out of customers long before they run out of snow, it's just the opposite in this strange (and hopefully never to be repeated) winter. I think it's great that SB, Loaf et al are firing the guns back up! Hope you get another storm or two as well. After skiing every weekend from Thanksgiving on, my family's last ski day for this year came on St Patty's Day, a month early. Here's to a COLD & SNOWY 2012-13!